As a parent you always want to make sure your children are safe. It's important to know that you can increase the level of fire safety in your home and improve the chances of your family escaping a fire unharmed. Keep things that can cause fire out of reach of children, especially matches, lighters & candles out of reach of children. Place lighted candles and tea lights out of reach of children. Make sure electrical appliances (TV’s and computers) in children’s bedrooms are switched off at night. Fit a childproof guard in front of open fires or heaters. The best ones can be fixed to the wall. Make sure children do not play near fires or heaters. This will avoid them getting burnt. Do not leave children unsupervised in kitchens as they can be a dangerous place for children. 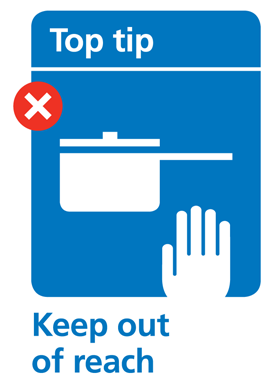 Make sure the saucepan handles don’t stick out to avoid them being knocked over. Fit smoke alarms and test once a week. Make an escape plan and involve the whole family. You could download and print Drago’s escape planner. Plan an escape route and make sure the children and child-minders or babysitters know it. Practise the plan together with the children. Be careful to keep all exits clear. Think about how you would get out if your escape route is blocked. Keep door and window keys where child-minders and babysitters can find them. Fit a carbon monoxide detector and test weekly. Make fire safety fun education. You will probably need to talk to children more than once, to make sure that they have remembered and understood what you have taught them. Practise your escape plan and stop, drop and roll with your children. Your family’s escape plan and what to do in if there is a fire. Remember to practise it regularly and display it where everyone can see it. To test your smoke alarms weekly. They could become the ‘Test it Tuesday’ champion for your family. Use Drago’s test it Tuesday tracker. If you see smoke or flames tell a grown-up straight away. Get out of the building as quickly as you can if there is a fire. Don’t go back in for anything, even toys or pets. Find a phone. You might need to go to the neighbours to find one. Call 999. Ask for the fire and rescue service and tell them your address. You might want to practise making this call with your children. Only call 999 in a real emergency. Never hide if there is a fire. Get out as quickly as you can. If there’s smoke, crawl along the floor. The air will be clearer down there. Put bedding or towels along the bottom of the door to stop smoke getting in. Open the window and call “help fire”. Stop. Don’t run around, you’ll make the flames worse. Drop. Lie down and roll around. It makes it harder for the fire to spread. Roll. Smother the flames with a heavy material, like a coat or blanket. Visit our kids zone for interactive fun and games that will help to educate children on fire safety.